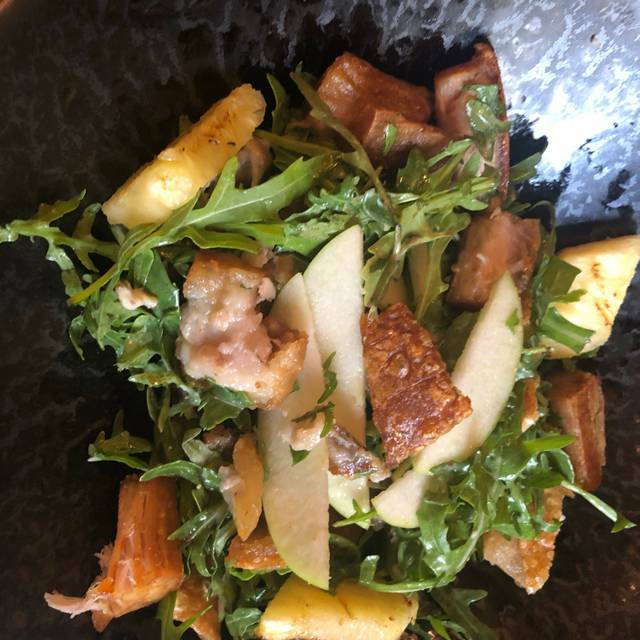 Lunch: Monday - Saturday: 11:00am - 3:00pm Dinner: Monday - Saturday: 5:00pm - 9:00pm Kitchen hours: Monday - Saturday: 11am -10pm PLEASE NOTE- We only take reservations for lunch or dinner in the dining room. We do not take reservations for drinks in the bar area. To be seated in the dining room, at least 1 main meal per person must be ordered. PARKING There is no onsite parking available for The Bank on Collins, however metered parking is available on surrounding streets. Alternatively, secure parking is available at the following car parks: 392 Bourke Street. For standard rates and prices please see the secure parking website. 123 Queen Street. For standard rates and prices please see the secure parking website. Please Note: Entry via 412 Collins Street. There is no disabled access for this car park. We are located a short 5 minute walk from Flinders Street Train Station. Tram numbers 11, 48, 109 and 1 all go down Collins Street, and stop just nearby. The Bank on Collins offers special menus for events such as Valentine's Day, Mother's Day and Father's Day. Check our website www.thebankoncollins.com.au for details of what special events we have coming up. The Bank on Collins is the perfect venue for those event organisers who simply wish to turn up and enjoy themselves, with our dedicated functions team ensuring that every detail is taken care of before the day. 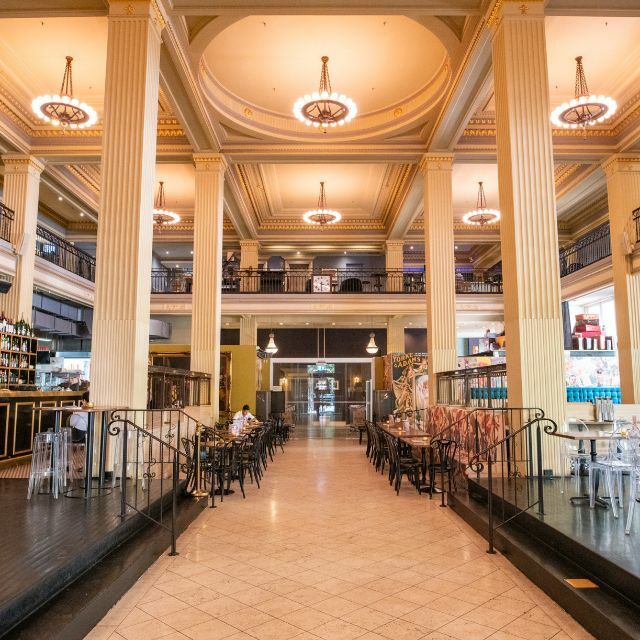 An event at The Bank on Collins is one where our wait staff take care of the little things, and all you'll have to do is enjoy the wonderful food and drink coming out to your and your guests. 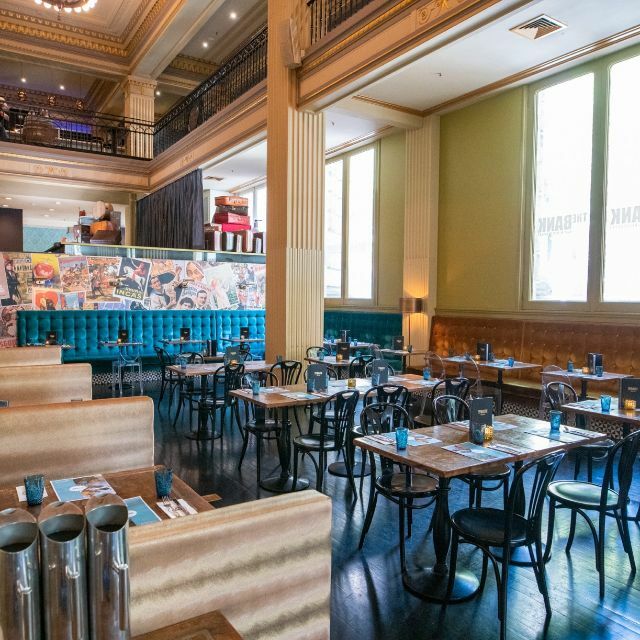 Sitting on the corner of Collins and Queens Street in the heart of the Melbourne CBD, The Bank on Collins is housed in a heritage listed building which used to be home to the Bank of Australasia. 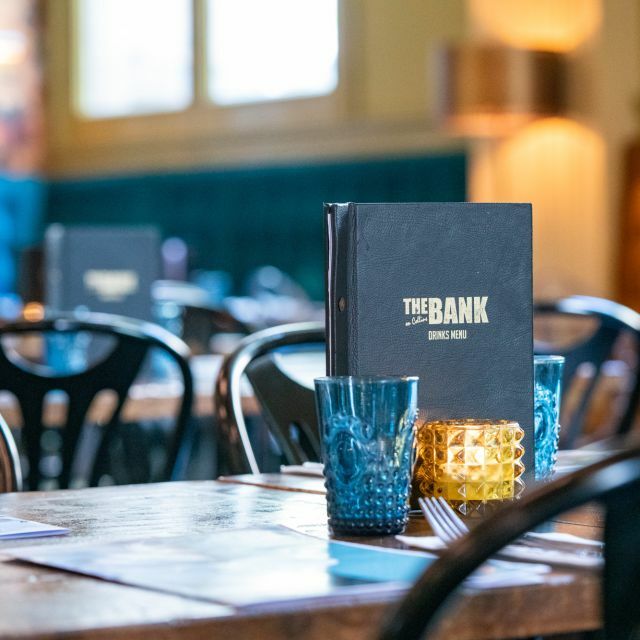 Now, The Bank is a stunning restaurant and bar popular with locals and tourists alike. 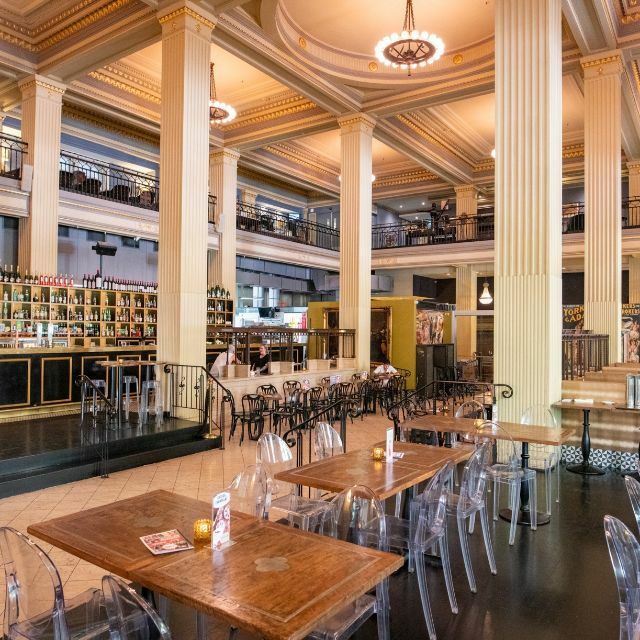 The Bank has a flexible layout that is suitable for large sit down lunches/dinners, or stand-up cocktail functions. Perfect for your next birthday, engagement, wedding or corporate function. Menu choices include; Lunch, A La Carte, Bar, Kids, $69 Set Menu, as well as dedicated Gluten Free and Vegan menus. Daily Happy Hour and food promotions. Collins Street tram stops directly in front, while the convenience of Melbourne Central and Flinders Street Train Stations only a short stroll away. 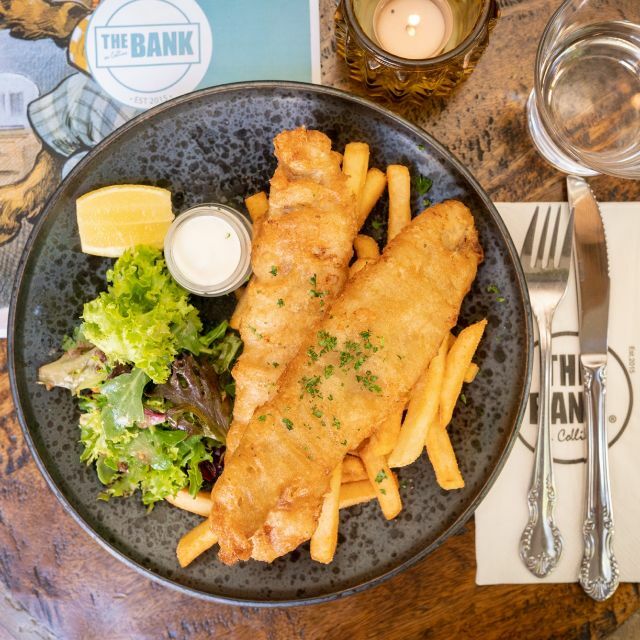 Private Dining at The Bank on Collins is suitable for Birthdays, Corporate events, Weddings, Engagements, Exclusive Functions and Dinners. This is a fabulous old building and the menu is great for gluten free and vegetarian or vegan options. Good value and choice. I/we love dining here; I/we keep on coming back here. The food is always good! Great food, cocktails and atmosphere...however it is incredibly noisy! Great venue but a bit noisy. Need soft furnishings to absorb the sound reverberating. The quality of the food is excellent and there are healthy options which is important to me! The service is always great! I’ll keep coming back! I have eaten here a few times and the food has been fine, but ordered a parma today and it was very dry. I didn't end up eating it all. 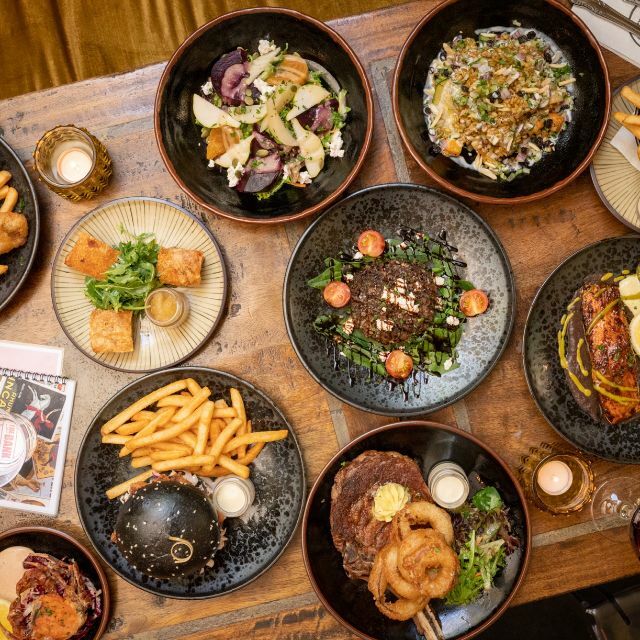 But otherwise great atmosphere, staff are good and the food I have eaten in the past has been nice, not great, but nice, but unfortunately would not order a parma again. Went to The Bank on Collins on a Saturday night for pre show dinner . Arrived early so enjoyed cocktails at the bar during happy hour (more ice than drink). Also ordered oysters Kilpatrick which come out as oysters in a rich mediteranian sauce? The other option was natural so not sure on their interpretation of Kilpatrick. The sample platter for entree was quite generous. Surf and turf was ok while the T Bone awad a bit tough. The dessert platter was also very generous for two people. Prices where very reasonable. Food is good, particularly the chips, good size portions and service is friendly. We pre-ordered and still had a bit of a wait but that's because it's pretty popular. Great place to eat before a show and theater. Good Quality food with a great old building architecture. Always a good time here. Great food, service and value for money. Always happy to recommend this place to friends. We took a group of clients to lunch it was great, they loved it and were very impressed. Very noisey venue, but sat in the corner and we were well looked after by the staff and nice food. Was overcharged for my salad and cappuccino but easily fixed when I drew this to their attention. The menu has a great deal of variety and it was great to have a vegan and a gluten free menu available. The service was excellent. Our waitress was polite and helpful and made our dining experience very pleasant. Thank you. The food was good as per usual; the service was a touch on the slow side. We keep on coming back. Rude wait staff. Lack of service. Had to ask for repeatedly for water. Asked for dietary modifications for pregnancy which were ignored. Everything was fine but it was spoiled because we specifically asked for no straws in the drink (because it is extremely wasteful) and we even had a conversation with our waiter about it and the drinks still came with straws. Perhaps if each drink contains more liquid and less ice this might not be necessary. Fix it. Save the planet. The value and service is outstanding. A beautiful setting and s thoroughly wonderful place for a long lunch. Highly recommend. Good place for a lunch time meeting and a catch up. Central for most people at that end of the city. Food and the venue is great however, service was a bit slow but it was super busy! Also, very noisy in the main dining area. The alcove area is much quieter but limited seating in this space. 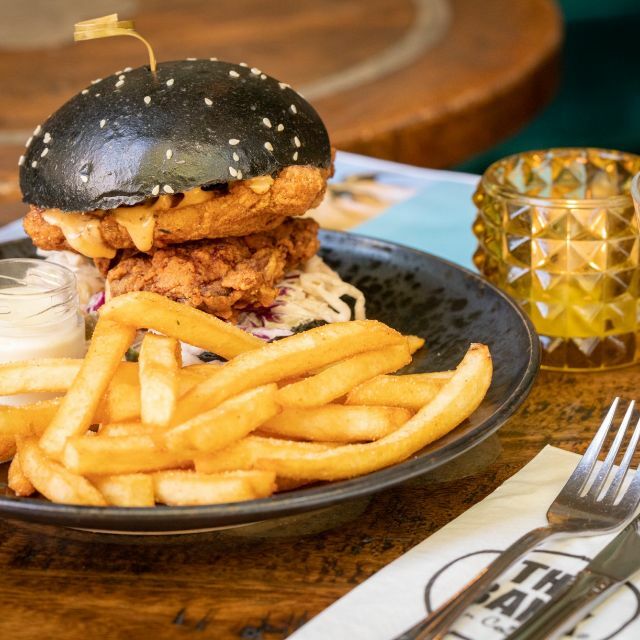 Relaxed café bar on the edge of the central CBD has a buzzy vibe and a varied menu. The salads were nice and interesting and flexible in terms of protein addition although the amount of salmon on my salad was light. Service was variable and the wine list limited. Still not bad value for money and a nice backdrop for a casual lunch. Great location and very active vibe. Cool place for a large group or party. Food was good and value for money in the expensive Melbourne market. 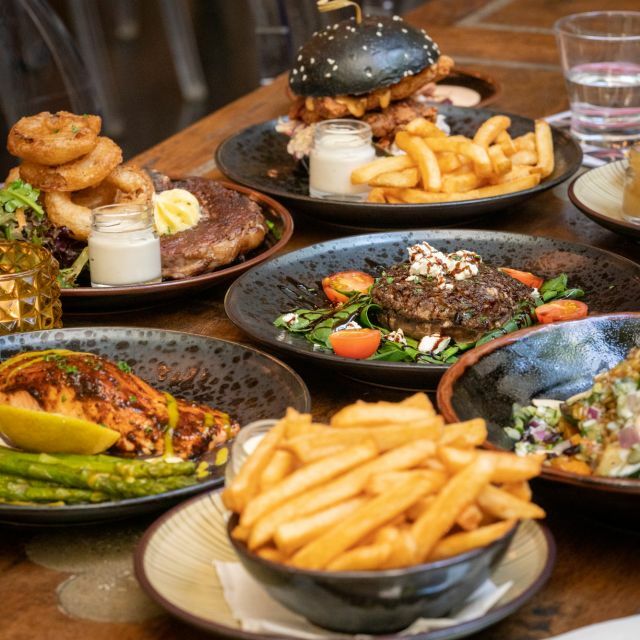 The food is consistently good; the service is good; the steak is cooked according to your request and my friends and I love the house cider. Well done again; I'll be back! We went for a pre show dinner, 2 Coeliacs excited by the separate deep fryer. We were seated promptly, brought a great gluten free menu. Our order was taken and we were eating in great time. The double fried chicken burger was fabulous, crispy and tasty. Crunchy fries and lovely onion rings. Well priced in a nice atmosphere. Friendly staff, delicious food and the meals were very generous! Excellent service, quality drinks, superb food that accomodated our dietary needs. Will definitely return! We arrived at 6:30 on Valentine's Day and were seated promptly, from that point on, our dining experience just went from better to outstanding, the service was exceptional, we ordered the Chicken wings as an entrée, which were absolutely divine and then the Surf and Turf as our main. The steak was cooked to absolute perfection, the prawns were really nice and the chorizo was simply melt in your mouth. The food and dining experience was so good, we cancelled our restaurant booking that we had made a month ago elsewhere to come back to this wonderful restaurant. I simply cannot recommend this restaurant highly enough. Both my wife and I have had many "Fine Dining" experiences, yet this was right on par with any of those experiences, yet at a very reasonable price. Very nice place with amazing tasting food and service to match. Highly recommended. This was a fabulous place to take our team to. Service, food and ambience were great. It did seem a little noisy at times however and this impacted on the overall conversation. Value for money was fantastic and I would definitely return. Amazing food yet again and the service was impeccable. A bit noisy, but not surprising on a Friday night. We’ll definitely be back! Fantastic food and service! It was not clear when ordering drinks off the happy hour menu so we were charged for larger drinks not covered by the happy hour which should have been properly communicated. The noise levels got very loud throughout the night but the over experience and ambiance was lovely. Would recommend to a friend to visit! Unfortunately this was the only bad experience I have had at The Bank. It was very disappointing though as the table was not ready (although reserved) and the food was cold.